If this is your first time logging into the Moodle Learning Environment, run a system check to ensure that your computer meets the minimum system requirements. Please click here for a System Check. You will also need to enable Pop-up windows for moodle.walshcollege.edu within your browser. Please check your browser's settings and enable pop-ups from this site. Click the "Login" button. You will be asked for your Walsh College username and password. If you need assistance logging in, you can contact the Walsh College Help Desk by calling 248-823-1350. If you have forgotten your password, or you wish to reset your password, please visit https://passwordreset.walshcollege.edu or click the "Reset Password" link. You will need to know your Walsh ID for this process. Note: passwords are case sensitive. 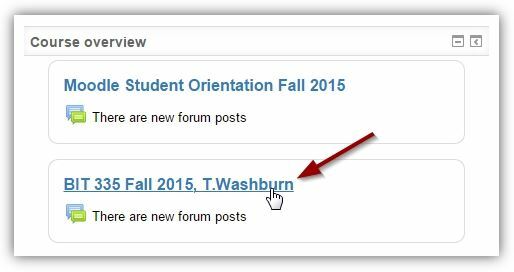 Your Moodle username and password is the same as your Walsh College Portal username and password. Remember, it is vital to the success of your online coursework for you to always remember your username and password. Once you are logged in, you will be brought to the "Dashboard" which is the landing page in Moodle. Here you will see a list of your available courses. To access your course, click the name of the course you'd like to enter. If you run into an error within your course and need technical support, click the Support icon located in the top blue border, next to the Mail icon. This will bring you to the Division of Online Learning's Help page. While support is available 7 days a week, you may not receive immediate assistance. You will, however, receive a reply within the next 24 hours.